It is only 1 month until Grace's first birthday party and my house looks like a ballerina's dressing room. The floors are covered in tulle and glitter, and I have been spending more time with my hot glue gun than my husband. It's a good thing he works all the time or I would start to feel like a bad wife. 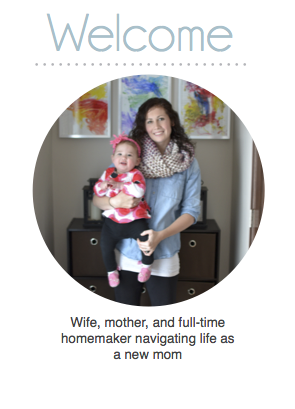 I know that Grace will never remember her first birthday party, but I can't help it. I always go big when it comes to parties. Over the next month I will be a painting, sewing, hot glueing machine, and will be writing a ton of DIY posts that include everything from decorations to appliquéd shirts. I have even decided to take on the task of baking and decorating a 3 tier cake all by myself. Please pray for me. 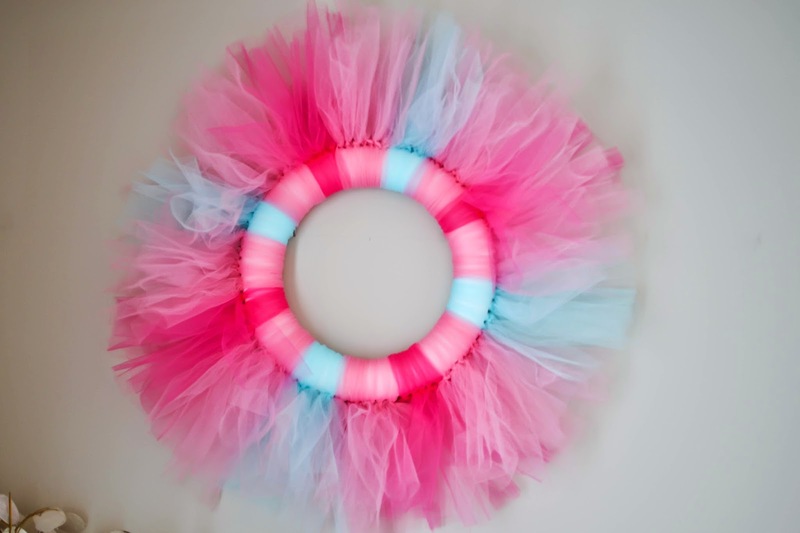 Since I had a bunch of tulle left over from making Grace's tutu for her cake smash I decided to use the excess to make a wreath. 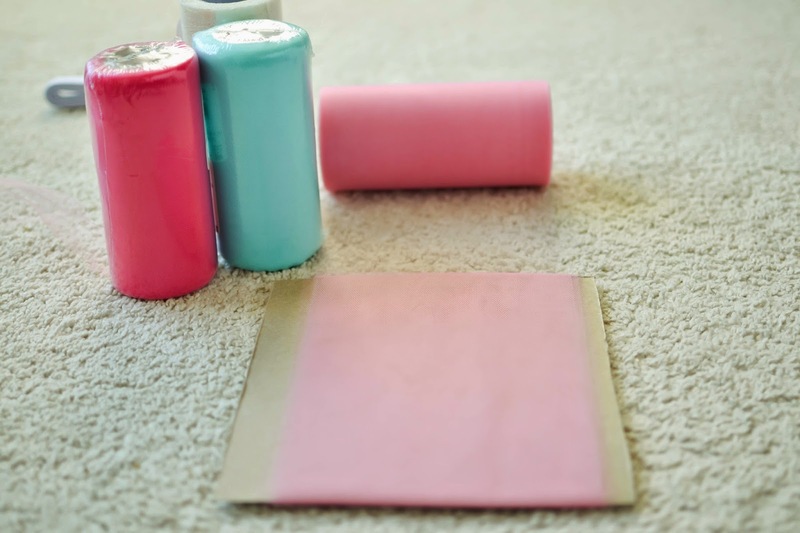 If you are using bolt fabric you will need to cut the tulle into 6 inch strips. 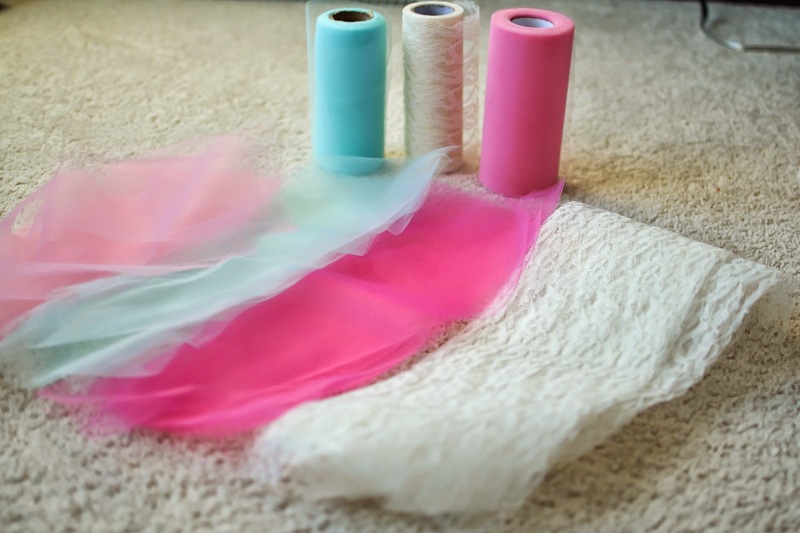 If you bought rolls of tulle you can skip this step. Next, you will need a piece of cardboard 10" long for a 12" wreath form or 8" long for a 10" wreath form. Starting at one end wrap the tulle around the length of your cardboard. A good rule of thumb is to wrap about half of the roll to start. 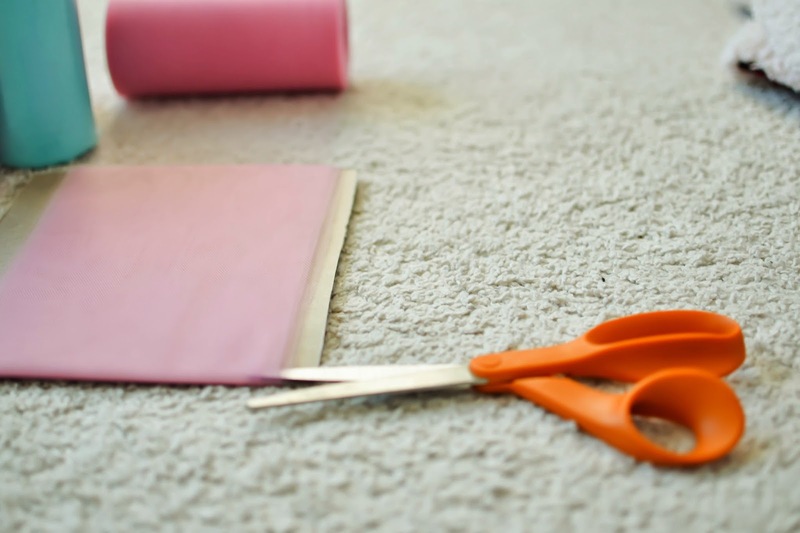 Cut the tulle on the side of the cardboard you started on. Only cut one side of the tulle. 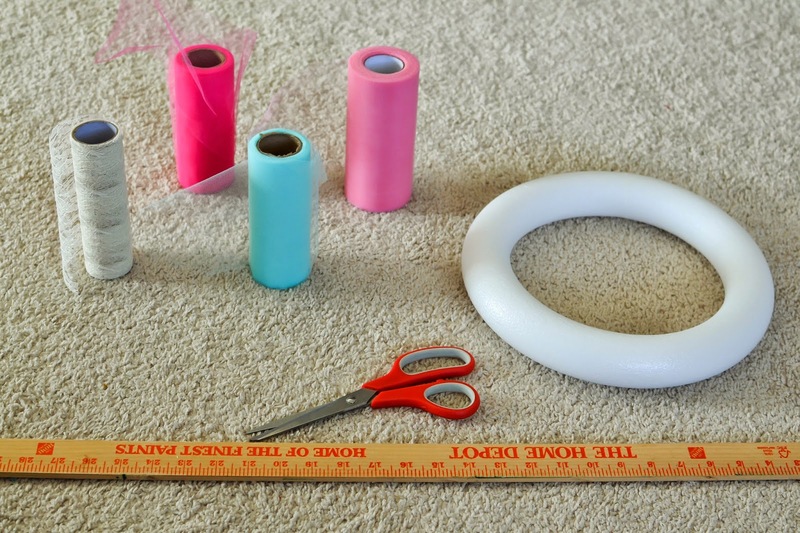 This should result in several pieces of tulle being 16" - 20" long depending on the size of your cardboard. Repeat the previous steps until you have strips of all of the colors you want to use. 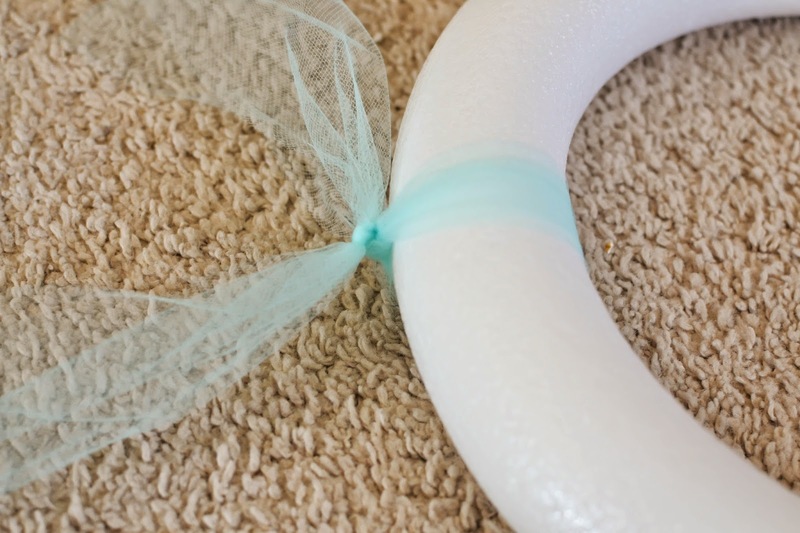 Tie the tulle on to your wreath form using a double knot. Make sure the ends are even before you tighten. 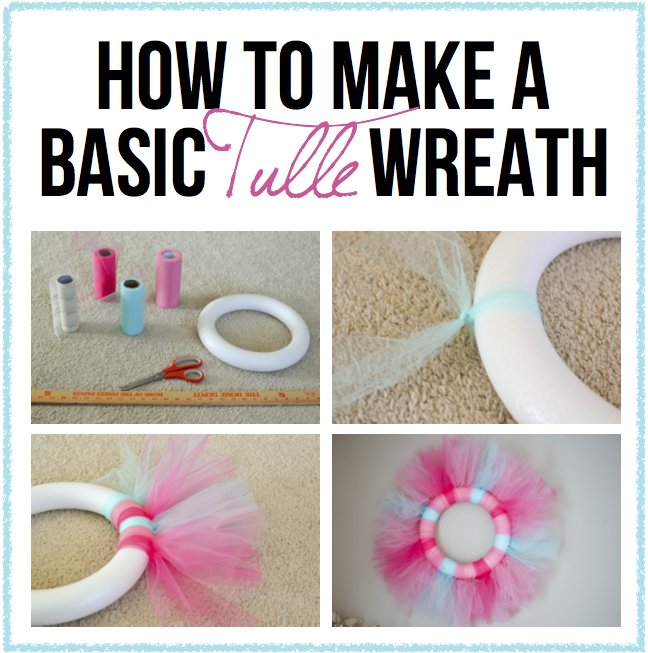 Continue adding tulle to the wreath until it is covered. I ended up tying 5 blue, 7 light pink, then 5 dark pink, but you can add your colors however you want. TIP: You can get some great ideas for holiday themed wreaths off of Pinterest. Once you have attached all of the tulle now is the time to show your creativity. 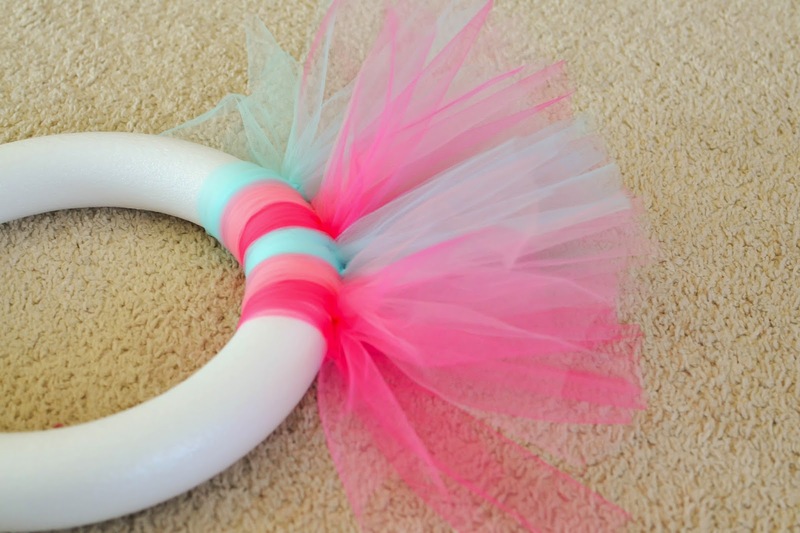 Add flowers, ribbons, and bows to the wreath to make it your own. I think I am going to hang a large wooden "G" from the middle of the wreath with ribbon for Grace's birthday. How is this hung? Do you have a picture hook or something on the back?